Der City-Rucksack von Stef Fauser Design hat es in sich: Er ist in der Größe variabel und passt sich den jeweiligen Bedürfnissen des Alltags an. Drei große Außenfächer, zwei davon mit Reißverschluss sowie ein großes, zusätzliches Steckfach im Rucksackinneren bieten genügend Stauraum für die wichtigen persönlichen Dinge. Sogar ein großer Aktenordner findet Platz. Darüber hinaus hat der Carringer im Inneren ein zusätzliches Etui mit Reißverschluss (22 x 16 cm), das mit einem kleinen Karabiner an einem Gurtband befestigt und somit abnehmbar ist. Die gepolsterten Tragegurte mit atmungsaktivem Netzstoff passen sich ergonomisch an. Der Versand innerhalb Deutschlands ist kostenfrei, für die EU und andere Empfängerstaaten müssen wir Versandkosten berechnen. 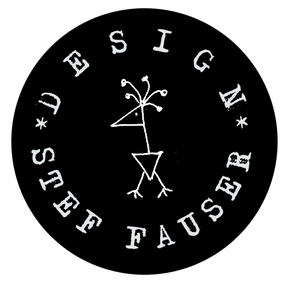 Stef Fauser Design was established in 2008 by Stefanie Fauser and Dietmar Goetz in Berlin, Germany. The story began with the little coin purse “Geldinger” which Stef designed for her friend Dietmar – a keen bicycle addict. The tube was the one he used at the Berlin bicycle race Velothon in summer 2008. The coin purse perfectly fitted into the little pocket of the bicycle shirt. It didn’t take long when his mates from the bicycle team also wanted their “own” driven tube item. Bit by bit Stef developed new designs. Since the preparation of the tube until it’s ready to be stitched was quite time intense she saved each little piece and part of the tube. The demand for those upcycled designs grew and Stef wasn’t able to do it all on her own. Dietmar then helped her and finally they were ready for the next step they founded the company Stef Fauser Design. It didn’t take long and the two had to expand even more. Previously, the two founders worked in different fields: Stefanie Fauser was costume and stage designer in various theatres whereas Dietmar Goetz had a job as editor and worked as freelance journalist. The idea behind the concept was to develop sustainable designs in times of a prosperous and disposal society, growing consumption and growing rubbish dumps. To attribute a used and apparently useless item a new meaning – a new value. Nowadays the inner tubes are thrown away instead of being repaired. So we asked local bicycle shops to collect the tubes for us instead of throwing them away. It was a win-win situation since the shop-keepers didn’t have to pay for dumping them and we had our raw material for free.Like the very first used tube of Dietmar’s bicycle each single tube has it’s own story: one might have been driven on a race, the other on a trip right over the Alps to Italy or on the way to get rolls for breakfast - unique tubes for unique people. The new business idea to upcycle bicycle tubes into fashion and home accessories was resoundingly successful and reinforced their decision to go international by attending renowned lifestyle fairs. Meanwhile Stef Fauser Design can be found in 15 countries all over the world. About the production: stronger together- working with disabled people. From the very beginning we have been working together with both mentally and physically handicapped people. We cooperate with different workshops for different works locally in Berlin: VIA Werkstätten which does the carpentry and the metalworks. At the NbW workshop the disabled cut and wash the tubes. They also do some light metalworks and assembly works. Working with disabled people is an extremely rewarding area of work which involves supporting disabled people to lead fuller, more independent lives. Like all employees, people with disability can bring a range of skills, talents and abilities to the workplace, working in all sorts of jobs, many holding tertiary and trade qualifications. It really is satisfying knowing that you are there to support those individuals. Our accessories are handcrafted from recycled bicycle inner tubes and wool felt or leather. The materials used are heavy duty, resistent and eco-friendly. The wool felt is made to our specifications in Southern Germany. All of our one-off pieces are locally made in Berlin and each goes with a unique serial number. Stef Fauser Design is a perfect fusion of unusual sense of style and functionality. It is focused on creating innovative designs that appeal to individuals with a broad range of interests and lifestyles. So, if you are no mainstreamer: join us and upcycle your life!